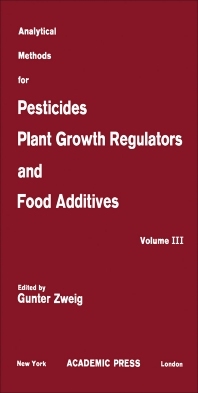 Analytical Methods for Pesticides, Plant Growth Regulators, and Food Additives, Volume III:Fungicides, Nematocides, and Soil Fumigants, Rodenticides, and Food and Feed Additives contains detailed analytical procedures for 14 widely used fungicides, five nematocides and soil fumigants, two rodenticides, and four food and feed additives. Each chapter of this 24-chapter volume discusses the history, biological and chemical properties, and physical constants of the different classes of compounds. The chapter presents first the general information, followed by intensive discussion of the methods of occurrence and residue analysis. Methods of analysis covered in each chapter include chemical methods, gas-liquid chromatography, colorimetry, and enzymatic techniques. Agriculturists, analytical chemists, and toxicologists will find this book rewarding.